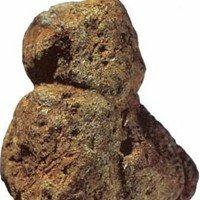 Discovery, Characteristics, Photo of Prehistoric Basalt Figurine: Golan Heights. The earliest art outside India. The early Stone Age figurine of Berekhat Ram (Birkat Ram), discovered in hills north of Israel, is believed to be one of the oldest pieces of prehistoric sculpture known to archeology. Although initially highly controversial - as some paleontologists preferred to see it more as a product of natural erosion rather than a deliberate human act of creativity - its status now seems more secure following the discovery of a second similar and contemporaneous figurine - the Venus of Tan-Tan, in Morocco. Furthermore, microscopic analysis by Alexander Marshack appears to confirm that humans were responsible for the figurine. Of equal significance is the fact that recently, examples of rock art from an even earlier Stone Age culture have been discovered in India - these are the petrogyphs of Bhimbetka - which supports the proposition that prehistoric art originated far earlier than previously thought. See also: Oldest Stone Age Art: Top 100 Artworks. Specifically, it exhibits three or more groove-like incisions, made by a sharp-edged stone, which give it the appearance of a human body. One incision is a deep groove that encircles the narrower end of the pebble (indicating the head), while two shallower, grooves cut into the sides (marking the arms). Recent microscopic research confirms that these incision are not the work of nature but the result of artificial intervention, indicating that the stone is definitely a work of Stone Age art. Its sister figurine, the Venus of Tan-Tan is morphologically so similar that it could have been sculpted by the same artist. Despite its name, the Venus of Berekhat Ram bears little if any resemblance to the European venus figurines of the later Gravettian culture of the Upper Paleolithic period, such as the Venus of Willendorf, the Venus of Brassempouy, the Venus of Lespugue, the relief sculpture known as the Venus of Laussel, and the Venus of Kostenky. The Venus of Berekhat Ram was created during the Acheulean culture of the Lower Paleolithic period of the old Stone Age, and has been dated to 230,000-700,000 BCE. The reason for the vagueness of its provenance is that it was found sandwiched between two layers of volcanic residue: an upper one dated about 230,000 BCE, and a lower one dated 700,000 BCE. This makes it (along with the effigy of Tan-Tan) the oldest example of mobiliary art ever recorded, and remarkably, it means that it predated Neanderthal man, and was created by an earlier hominid like Homo erectus.  See also: Blombos Cave Engravings.  For the origins of painting and sculpture, see: Homepage.